Today Maria created and adorable shaker scene for her card! 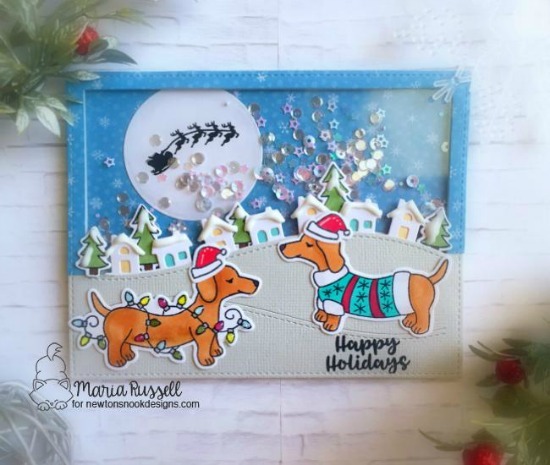 She started with those two cute pups from our Holiday Hounds Stamp Set and colored them in fun bright colors! She trimmed them out with the coordinating Holiday Hounds Die Set and gave them cute little Santa hats too! Then she created an amazing scene for those pups on her card. She created some hills using the Land Borders Die Set in the foreground and then added some cute little houses and trees along the skyline. Those trees are from the Snow Globe Scenes Stamp Set. Behind all of that she created an awesome shaker window with a pretty sky filled with sequins and a big moon! The silhouette of Santa and his reindeer in the sky is also from the Snow Globe Scenes Stamp Set. For the sentiment she used "Happy Holidays" from the Snow Globe Scenes Stamp Set too! This card is so incredible! The layers and details really make it feel so festive! That really is the perfect Christmas shaker card !